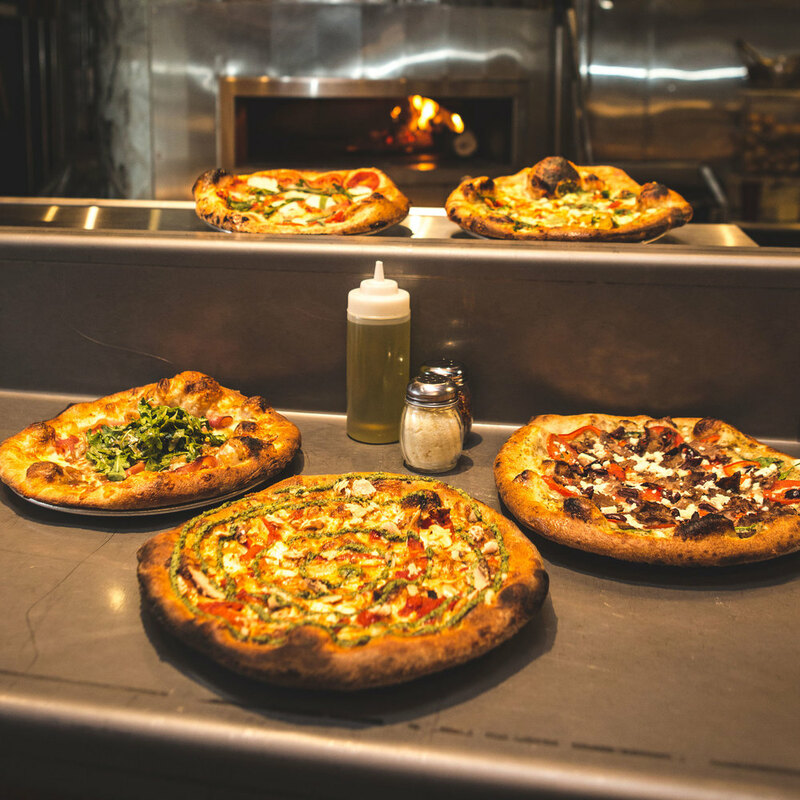 In 1998, a great location and the desire to produce superb pizza led Dan and Ken Bothman to create La Fiamma Wood Fire Pizza. 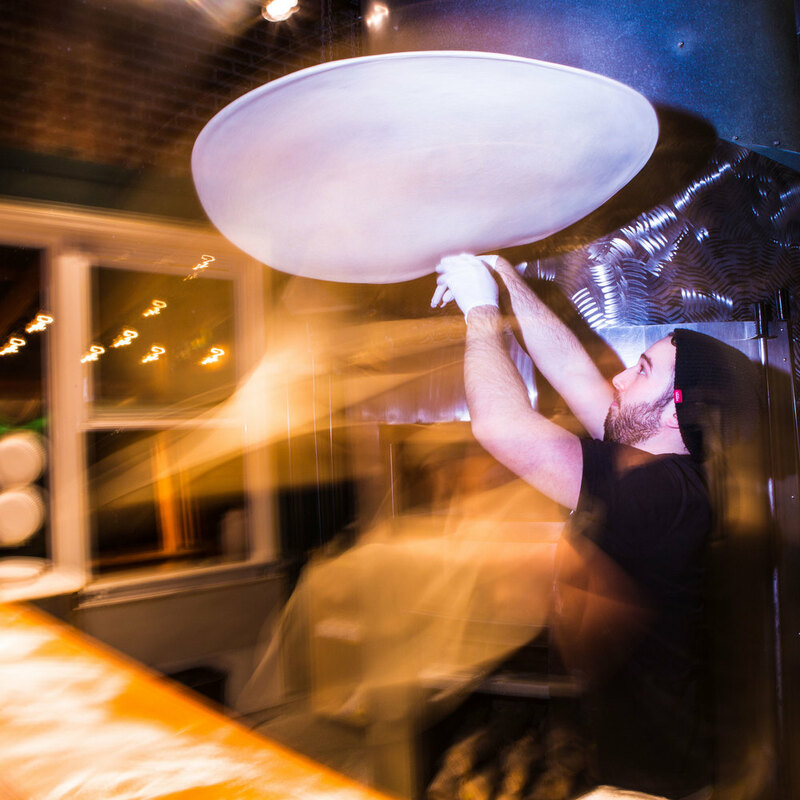 An immediate sensation, Dan and Ken’s restaurant was showered with acclaim, winning the Best New Business and Bellingham’s Best Pizza awards, as well as garnering two Best Recipe awards in the National Association of Pizza Operators (NAPO) International Recipe Contest. But stellar pizza isn’t the only reason to visit La Fiamma. The stylish décor and vibrant atmosphere delight and entice both young and old and everyone in between. 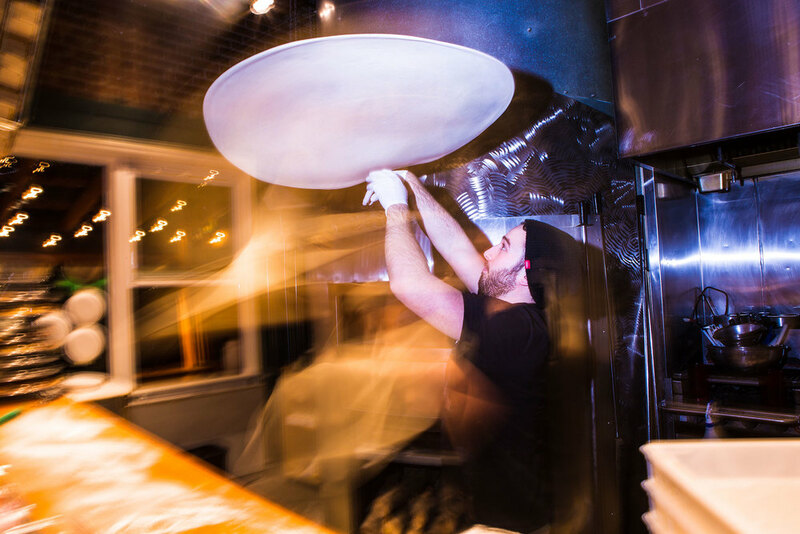 You can witness the display of a pizza’s progression through the kitchen (kids love it), or you can relax in our heated outdoor dining area, and catch an amazing sunset over the San Juan Islands. The La Fiamma experience is always a fusion of personality, ambience, and incredible food. An 11-inch pizza (63 square inches of toppings) - Perfect for ONE person . with a GOOD appetite or TWO if you aren't so hungry. A 15-inch pizza (132 square inches of toppings) - WOW! - What a bargain! More than 2x the topping area of the medium pizza. Perfect for 2-4 folks, or buy a large just for yourself and have a traditional Italian breakfast - cold pizza. Yumm. The vegetarian version of the GRECIAN FORMULA. Starts with our herbed white sauce and topped with fresh spinach, red bell peppers, Roma tomatoes, grilled artichoke hearts, Kalamata olives, feta and mozzarella. A roasted vegetable, tomato and porcini mushroom sauce, topped with Kalamata olives, roasted bell peppers, caramelized onions, shitake and white mushrooms, mozzarella and feta cheese, and fresh rosemary. Chunky San Marzano style tomato sauce, mushrooms, red peppers, red onion and mozzarella. Pesto sauce, shrimp, grilled artichoke hearts, mozzarella, parm and asiago cheese. Ken’s Grandpa’s secret recipe for smoked salmon, smoked lightly over hickory. With roasted garlic, roasted red peppers, mozzarella and chèvre cheese, finished with a cilantro-almond-caper pesto. Potato Gorgonzola + Fennel Sausage Rosemary roasted red potatoes, caramelized onions, our housemade fennel Italian sausage with gorgonzola and mozzarella cheese and a drizzle of balsamic vinegar syrup. Prosciutto, caramelized onions, + mozzarella, out of the oven topped with a fresh arugula salad tossed with a fig balsamic vinaigrette. Housemade bbq sauce, slow smoked pork shoulder, smoked mozzarella, and out of the oven topped with tangy shaved fennel, nappa cabbage and cilantro coleslaw. Herbed white sauce with fresh spinach, red peppers, Roma tomatoes, marinated & grilled tri-tip steak (we use natural beef from Misty Isle Farm), Kalamata olives, feta and mozzarella. Mo-made lamb sausage, a roasted vegetable, tomato and porcini mushroom sauce, Kalamata olives, roasted bell peppers, caramelized onions, mozzarella and feta cheese, and fresh rosemary. Our Momade chicken, sun dried tomato and arugula sausage with our smoked onion bbq sauce, red onions, roasted red peppers, smoked mozzarella and cilantro. A baked potato pizza? Yep. Roasted garlic mashed potatoes, Hempler’s bacon, cheddar cheese, smoked mozzarella, scallions, our house made BBQ sauce, and finished with sour cream. Grandma Mataio’s sliced meatballs, tomato sauce + fresh herb ricotta, spinach, caramelized onions, black olives, mozzarella and provolone. One of our favorites. Tomato sauce, prosciutto (no, prosciutto is not a cheese, or a vegetable, it’s a salt cured Italian ham), rosemary, red onion, mozzarella and freshly cracked black pepper. Tomato sauce, housemade fennel Italian sausage, red onions, red peppers, Kalamata olives and mozzarella. Sausage, roasted red peppers, caramelized onions, tomato sauce and mozzarella. A sodium rich, meat lovers’ delight. Thinly sliced prosciutto, pepperoni, dry aged salami and our housemade fennel Italian sausage. Tomato sauce, Coppa ham, sliced pineapple and mozzarella. Pepperoni, Italian Sausage, mushrooms, olives, red peppers, onions, tomato sauce and out three cheese blend. Tomato sauce, 3 cheese blend, caramelized onion, black olives, Italian sausage, salami, and mushrooms. Some like it hot. Spicy tomato sauce, housemade fennel Italian sausage, hot pickled cherry peppers and mozzarella. Sometimes a plain cheese pizza is just what you want. Yes… we have pepperoni, and oh what good pepperoni it is. A personal size (8” or so) of any of our pizzas and a small green salad. Such a deal! Served until 4:00 every day. 8" pizza. If you have extreme allergies, please note that though we take reasonable precaution to avoid cross contamination, we use a tremendous amount of flour on a daily basis...it's "in the air" and trace amounts WILL exist. We cannot guarantee 100% wheat/gluten/allergen free. Dairy free, soy free, vegan "mozzarella" can be substituted upon request. Olive Tapenade w/ Herbed Goat Cheese Mediterranean olive blend with roasted peppers, onions, basil pesto, sun dried tomatoes and capers. Served with pita chips and herbed goat cheese+ricotta spread. perennial favorite of NYC pizzerias. Pizza dough, brushed with butter, olive oil, garlic and herbs. Tied in a knot with a sprinkle of parm, romano and mozz. 3 knots. Served with chunky marinara or ranch. Mini penne rigate and a creamy béchamel cheese sauce with provolone, mozzarella, parmesan and white cheddar. Topped with breadcrumbs and broiled brown and bubbly. Artichokes, roasted garlic and 5 cheeses (parmesan, mozzarella, white cheddar, provolone and feta) baked in a cast iron skillet and served with house made pita chips. A flavorful fresh mix of tomatoes, olives, cucumbers, capers, red peppers, and a little spice. Topped with feta cheese and served with pita chips. Three hearty meatballs in a summery San Marzano style tomato sauce topped with provolone, parmesan and fresh basil. Served with a piece of garlic toast. Puréed Pedrosillano chickpeas from Spokane, with sesame tahini, garlic, lemon and spices. Served with our freshly baked pita + cucumber slices. Creamy tomato soup with fennel and serrano finished with basil pesto. Mmm… better than Campbell’s. We will usually have another selection for your enjoyment, but sometimes we run out. Your server will let you know. Romaine and shredded Nappa Cabbage tumbled with our sesame mustard dressing, topped with sliced grilled chicken breast, veggies, toasted almonds and black sesame seeds. Crisp romaine + shredded Nappa Cabbage with our traditional lemon garlic Caesar dressing, brioche croutons and shaved parmesan. Mixed greens, roasted peppers, tomatoes, bacon, and of course, gorgonzola! With our fig balsamic vinaigrette and candied pecans. Classic Chop. Crisp iceberg lettuce (yes, iceberg! It wouldn’t be a chop salad without), grilled chicken, salami, four cheeses (gorgonzola, mozzarella, provolone and white cheddar), tomatoes, garbanzo beans, black olives and pumpkin seeds with white balsamic and herb vinaigrette or our house ranch. Piping hot corrugated sandwiches from our super-duper fancy Italian sandwich squisher. Made on our home made rosemary focaccia. Served with a small mixed green salad [substitute cup of tomato soup for 2.50 (a little more for ??? Soup)]. Grilled chicken breast, fontina cheese, thinly sliced red onion, and our home made Dijon mustard mayonnaise. Grilled on herbed focaccia. House smoked pork shoulder, prosciutto, pickles, coarse mustard, and tangy shaved fennel, nappa cabbage and cilantro coleslaw. Summer’s here. Marinated roma tomatoes, fresh mozzarella, fresh basil, fire roasted red pepper pesto and a drizzle of reduced, aged balsamic vinegar come together for this La Fiamma summer favorite. Life is Beautiful (but a little sunshine wouldn’t hurt). Open-faced and messy meatball sandwich on a yummy Italian torta roll with our summery San Marzano style red sauce and provolone baked in the wood oven. With a baby green salad. Grilled chicken breast, Provolone cheese, roasted red peppers, arugula, and basil pesto mayonnaise. Marinated and grilled all-natural tri-tip steak, fire roasted peppers + onions, horseradish mayo and Provolone. Half* a grilled cheese sandwich made with Tillamook Cheddar on our rosemary focaccia, and a cup of our Tomato Basil soup. *Sorry, 1/2 Panini is only available on the Rainy Day Special. Ken’s Grandpa’s secret smoked salmon recipe, lightly smoked over hickory. Served in a red pepper and pesto cream sauce. There’s Italian and there’s American. There’s also Italian-American. Alfredo is a gloriously rich pasta dish in the Italian-American tradition. Try it! You know you want it. Made with sweet cream butter, garlic, white wine, heavy cream and imported parmesan cheese. A robust southern Italian tomato sauce with hand-crushed San Marzano style tomatoes, minced garlic, onion, capers, Kalamata olives, fresh oregano, crushed red chili flakes (and a teeny tiny bit of anchovies, you won’t even know they’re there). Well, it’s actually Bucatini + Meatballs. Bucatini is a long, round and barely hollow pasta that looks like giant spaghetti. Our awesome homemade meatballs, served with our summery tomato sauce and finished with parmesan and romano cheese. Served with a piece of garlic toast. Available to children 10 and under only please. All kids orders must be accompanied by an adult order. Tillamook Cheddar on our rosemary focaccia. Our housemade lemonade infused with fresh rosemary. A recipe we stole from Café Flora in Seattle, and (although they deny it ;-) turns out they stole it from The Herb Farm in Issaquah. Fragrant and complex. Premium black teas, tropical fruit flavors and a dash of citrus make this iced tea one to rave about. Legend has it that Leonardo da Vinci was cured of his ailments during his visits to the mineral springs in the Italian Alps known as San Pellegrino. Put a little sparkle in your life. From MANIAC ROASTING CO. Try it straight, like the Italians, or we can add some hot water and make it an Americano. cappuccino, just more milk and less foam. From BARNES AND WATSON FINE TEAS. Green, Peppermint, Chamomile, Herbal or English Breakfast. Sudden Valley Ranch, White Balsamic, Fig Balsamic, Smoked Sun dried Tomato Vinaigrette, or Sesame Honey Mustard. English toffee & peanut butter chocolate fudge brownie, topped with vanilla ice cream and fudge sauce. This dessert brings back wonderful memories of sitting by the campfire, toasting marshmallows and making s’mores. Remember those hot ’n’ gooey graham cracker and chocolate bar desserts? A homemade graham cracker shell, filled with gooey caramel and Belgian chocolate, topped with JettPuff marshmallows and toasted to perfection in our wood-fired oven. Yumm. Just like grandma made. Sliced Fuji apples fire roasted with cinnamon and brown sugar. Crowned with a crumble topping and baked in the woodfired oven. Finished with a scoop of vanilla ice cream. Chewy homemade ginger, ginger, ginger cookies, vanilla ice cream, and covered with our own warm caramel sauce. Vanilla ice cream, orange cardamom syrup and our homemade ginger beer. Smoked country ham (or veggies), spinach, poached eggs, hollandaise. Hempler’s bacon, sausage, poached eggs, cheddar and potatoes. Bacon, roma tomato, pulled pork, mozarella, white cheddar and provolone cheeses, topped with iceberg lettuce, arugula and smoky aoli. Smoked or fresh Mozzarella, arugula, perfectly poached eggs and basil pesto. Served on a bed of potatoes with two perfectly soft boiled eggs on top. Onions, red peppers, smoked ham and cheddar cheese. A classic! Fiamma scratch biscuits, house-made gravy, sausage and Hempler's bacon. Marinated grilled tri-tip steak, caramelized onion, shiitake mushrooms and smoked mozzarella. Pesto, brie and a Seasonal blend of local roasted vegetables. Creamy cheese sauce, breadcrumbs and mini penne noodles broiled golden brown. Served without potatoes or eggs. Two pieces of our cinnamon, vanilla and orange zest French toast with whipped butter, seasonal fruit sauce, syrup + powdered sugar. A sweet popover pancake served with maple syrup and powdered sugar. Pizza meets Dutch Baby. With cream cheese, ginger streusel topping and raspberry compote. Add a side of our famous Bloody Mary Mix to your favorite brew. Fresh OJ or Slushy with a split of Lunetta Prosecco. Maniac Roasting Cold Brew with house made Irish Cream topped with whipped cream. San Marzano tomato juice, chipotle peppers, hatch chiles, and smoked onion. Fiamma’s special blend of ghost pepper and roasted carrot juice. We dare you! Rosemary vodka with our San Marzano tomato juice and special spice mix make up our signature Fiamma Bloody Mary. Bacon or sausage, egg and potato. Choice of fruit sauce topped with whipped cream. The Bartender’s Breakfast (without booze, of course) makes a great kids brunch. La Fiamma's late-nite slice window. 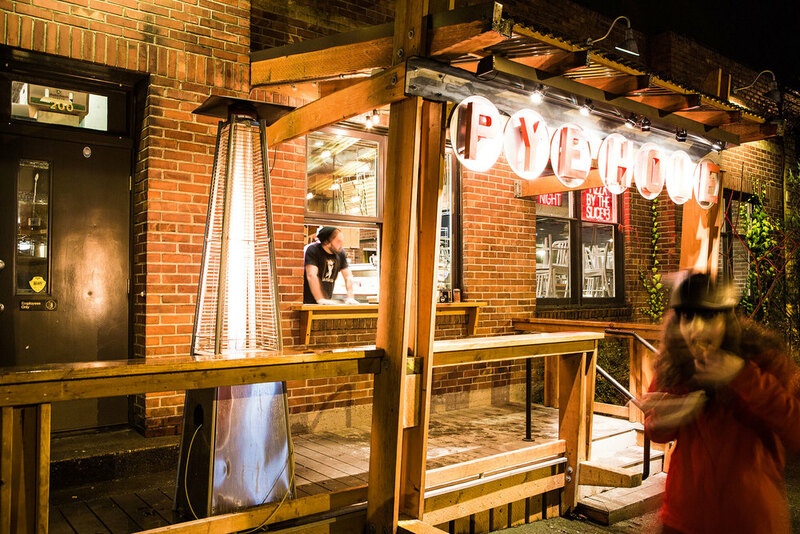 DAYTIME - Come grab lunch or dinner starting at 11AM every day. It's the fastest lunch downtown, and we've got slices, salads and drinks just for you. 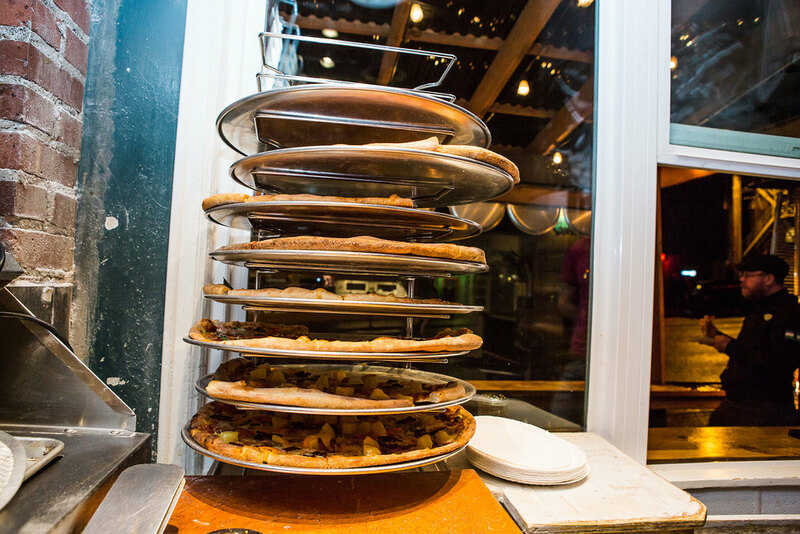 LATE NITE - After 10PM Thursday through Saturday nights, we are open for slices and pies served at the side of La Fiamma. If the fire's on, there's pizza for you, drunky-pants.